Have you seen the new Healthy Eating Pyramid? – What About Health? 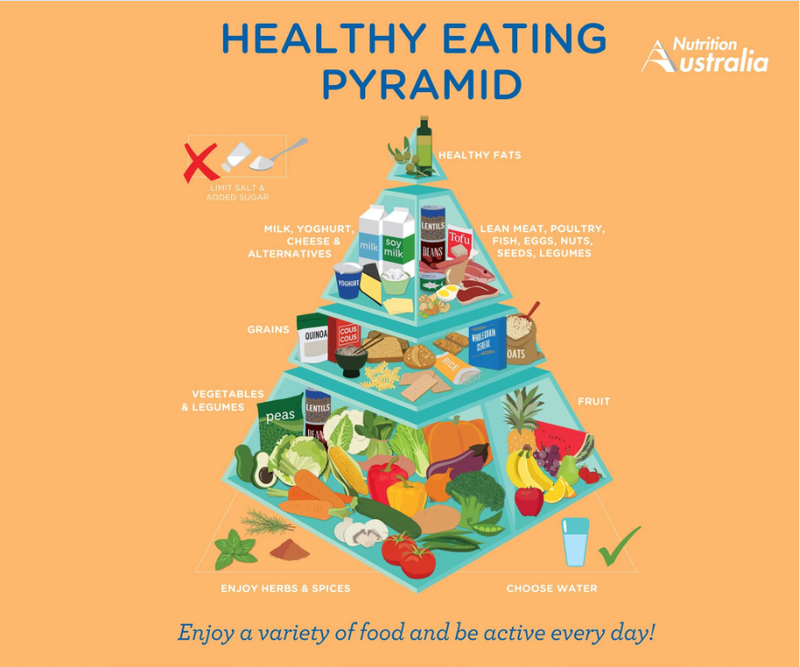 The pyramid shows you how to eat healthily. With all the fad diets around, its exciting to have a clear picture of what a healthy eating is. A few things have changed over the past 15 years. New survey data show what Australian’s are actually eating, making it easier for health professionals to know what they need to emphasise. The Dietary Guidelines were updated in 2013 (supported by more than 55,000 scientific papers). The new pyramid reflects the changes in the dietary guidelines. Below is the older pyramid and the new pyramid – check out the differences. My favourite things about the new pyramid! Vegetables are definitely the main focus – and they deserve to be! The amount of research is overwhelming on the health benefits of eating fruits and vegetables. Plus they taste great too. Only 7% of Aussies actually eat the recommended 5 serves – perhaps another reason they are staying at the bottom of the pyramid. Because they make food taste so wonderful. We have almost 10x the amount of salt we need (that’s crazy!). The pyramid says to limit our intake of salt – but that doesn’t mean that our food has to taste boring. Herbs and spices are great for our health and our taste buds! My most used herbs at the moment are chives, rosemary and chilli! This is my herb garden below, you don’t need much space to have one. 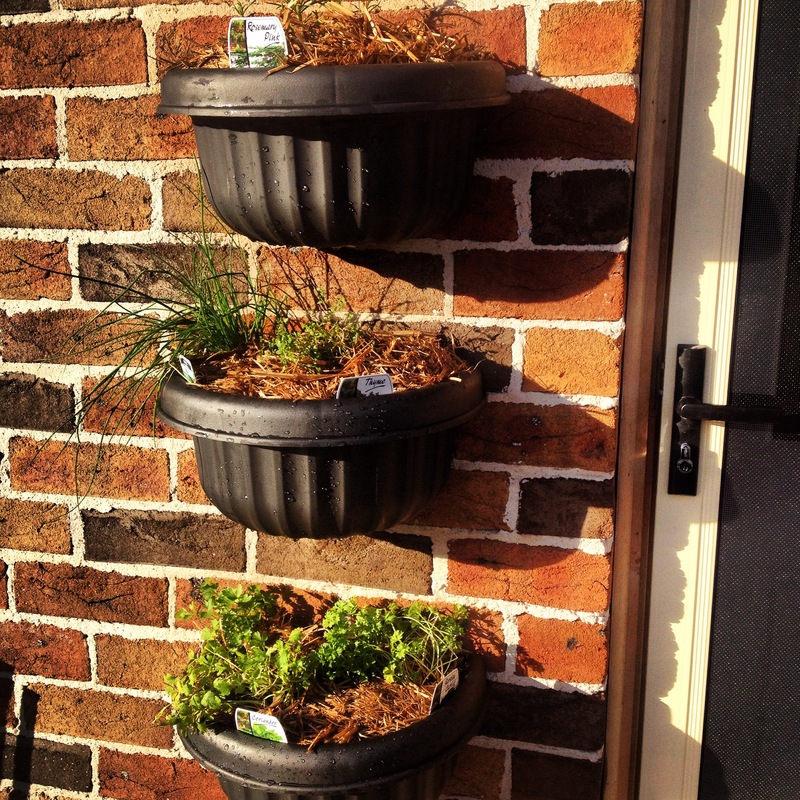 It’s so handy being at my door – to quickly grab herbs when I’m cooking. There are many things people claim that we need to be healthy. You just need some coconut oil, chia seeds, this powder, some raw exotic food… You get the point. 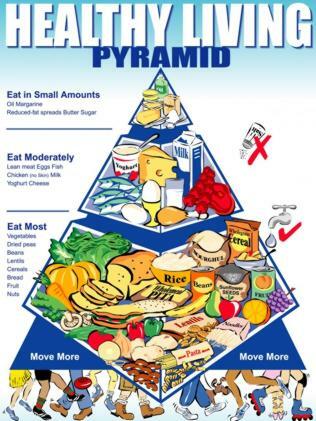 The pyramid shows healthy eating is eating in moderation. Include food from each food group and limit salt and sugar. Easy. Incorporating that into your life may be a bit tricky if your not used to it, but at least you know what healthy eating really is, backed by science. Why does the pyramid matter in my life? If you’re feeling confused about all the nutrition messages that are out there – the pyramid should be your first point of reference! Winter is fast approaching. The time of hot chocolate, warm desserts and extra food which is great in moderation. Maybe we need to be sitting down to more warm roast veggies, hot soups of all sorts, slow cooked meals with meat and veggies packed with herbs and spices. Pingback: 7 simple pictures to master healthy eating – What About Health? Pingback: Is Coconut Oil Healthy? | What About Health?